Filming on the first episode of Sherlock‘s fourth season is now complete, so things are moving forward on the series’ second episode (the show’s twelfth overall). As such, a juicy bit of casting news has been revealed. 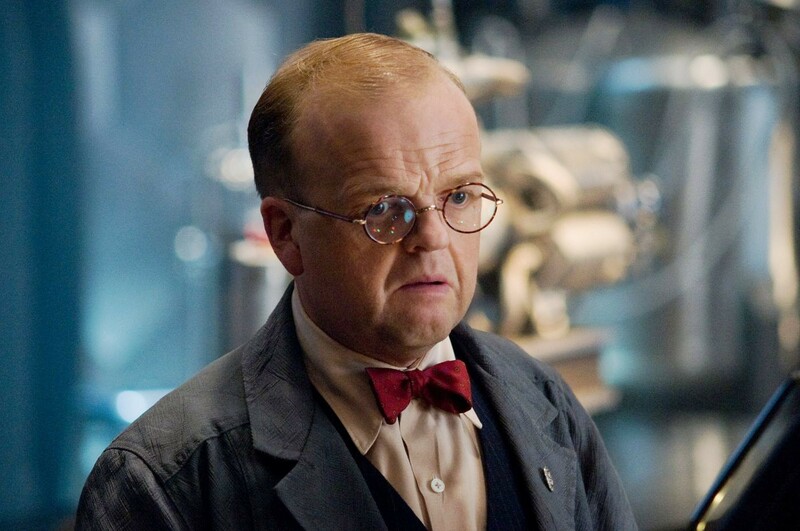 Acclaimed Hollywood star Toby Jones will be playing the villain of the episode. The actor has appeared in numerous blockbuster roles, including voicing Dobby in the Harry Potter franchise, Dr Armin Zola in the Captain America films (above) and Claudius Templesmith in The Hunger Games saga. He has also worked with the Sherlock creators before – he starred as the Dream Lord in ‘Amy’s Choice’, a Doctor Who episode exec produced by Steven Moffat, and has appeared with Mark Gatiss in Dad’s Army. Sherlock fans, start your theorizing! Jones’ episode will be directed by Nick Hurran, who also helmed Series Three’s ‘His Last Vow.’ The previous episode is directed by Doctor Who‘s Rachel Talalay, the first female director to work on the show since Coky Giedroyc filmed the unaired pilot. Series Four is expected to air in early 2017. They already did the Master Blackmailer last season so it is NOT him! My first thought was “Milverton”, but then I remembered the previous episode. Which other villain would qualify?